Vancouver, B.C……..Corvus Gold Inc. (“Corvus” or the “Company”) - (TSX: KOR, OTCQX: CORVF) announces the results of an independently prepared Preliminary Economic Assessment (“PEA”) for the optimization of the North Bullfrog Project in Nye County, Nevada. The optimized plan is based on an updated resource estimate, which has not been updated to include the 2012 drill results in the north area step-out and Yellow Jacket areas, both of which have returned encouraging results. The Company is planning to issue an updated resource estimate and updated preliminary economic assessment in late 2013 following the completion and interpretation of the aggressive drill program currently underway. 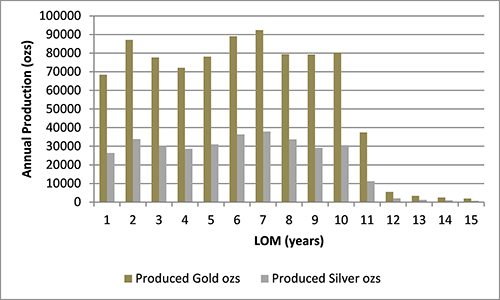 The optimized PEA produces a robust, positive economic analysis at a $1,300 gold price (all $ US) for a conceptual, low capex, heap leach project that generates average annual gold production of 76,500 ounces over 11 years with a 4.7 year payback (Table 1), at a life of mine (“LOM”) strip ratio of 0.53 to 1 (overburden to process feed) and cash operating costs of $778 per ounce of gold (Table 5). The project remains strongly positive at a gold price of $1,200 and exceptional at the three year trailing gold price average of $1,500 with a pre-tax, pre-royalty NPV(5%) of $276.0 M and an IRR of 37.9% (Table 2). Large in-pit resource of 1.1 M ounces contained, and 852,700 ounces recoverable, gold. High gold recovery with a low cost heap leach system averaging 80% gold recovery, life of project. Average annual production of 76,500 ounces gold & 30,000 ounces silver at total cash cost of $778/gold ounce. Low entry cost gold project with initial capex $101M inclusive of $36M of contingency and pre-production/indirect costs, engineering studies and permitting. Strong leverage to gold with NPV(5%) $146.8M, 23.1% IRR and 4.7 year payback at $1300 gold increasing to NPV(5%) $469.8M, 59.2% IRR and 1.7 year payback at $1800 gold. PEA resource does not include 2012-13 step-out exploration results which indicate significant potential resource expansion and consequent project economic enhancement potential. Favourable low strip ratio of 0.53. Potential fast track development project with strong local, regional and Federal support that is within the scope of a junior company. Favourable permitting environment, with recent examples of timely approvals. Excellent infrastructure for mine development - highway and grid power located a few kilometres from deposit and an existing, skilled mining workforce available in the nearby communities. Recently expanded land package to 70 km² to cover potential gold system extension and to address potential for a much larger future mining operation. Figure 1. Projected North Bullfrog PEA production profile. The PEA assumes the development of a conventional drill and blast, surface mine using haul trucks and front end loaders, and heap leach processing of the mineralized material. Mineralized material would be delivered to a crushing plant, where it would be crushed to 80% passing minus 19 mm (¾ inch), then transported and stacked on heap leach pads using a conveyor/stacker. A leach solution would be used to dissolve the gold and silver, which would be processed through a standard carbon-in-column leach plant, with a doré produced in an on-site refinery. Physical data for the mine operation are summarized in Table 3. The PEA utilized estimates of heap leach recovery based on column leach testing data for composite samples constructed from Mayflower, Jolly Jane, Savage Valley and Sierra Blanca 2012 PQ core drilling. At total of 23 column leach tests have been run at McClelland Laboratories Inc. at a particle size of 80% passing -19 mm (-3/4 inch) between the four resource areas. The process recovery assumptions reflect consideration of the particle size resulting from primary and secondary crushing to P80 -19 mm (-3/4 inch) and the leach pad placement schedule. The leach pad production model predicts an average gold recovery of 80%, and an average silver recovery of 8% of fire assay grade. The Company cautions that the PEA is preliminary in nature, and is based on technical and economic assumptions which will be further evaluated in more advanced studies. The PEA is based on the North Bullfrog resource model (as at June, 2013) which consists of material in both the indicated and inferred classifications. Inferred mineral resources are considered too speculative geologically to have the economic considerations applied to them that would enable them to be categorized as mineral reserves. The current basis of project information is not sufficient to convert the mineral resources to mineral reserves, and mineral resources that are not mineral reserves do not have demonstrated economic viability. Accordingly, there can be no certainty that the results estimated in the PEA will be realized. The PEA results are only intended as an initial, first-pass review of the potential project economics based on preliminary information. The Company will file an updated NI 43-101 technical report (the “Report”), which will include the results of the PEA, on SEDAR within 45 days, and investors are urged to review the Report in its entirety. Estimated capital costs are listed in Table 4, where they are divided between initial and sustaining capital. The initial capital is estimated to be $101.2 M, which includes equipment and construction, EPCM and Contingency. Sustaining capital includes leach pad expansions, mobile equipment purchases and rebuilds. Life of mine sustaining capital is estimated to be $108.8 M.
In-pit resource – Indicated 26.9 Mt at 0.290 g/t for 250,750 Au Oz. In-pit resource – Inferred 124.9 Mt at 0.203 g/t for 816,650 Au Oz. Working capital and initial fills, which are recovered at the end of the project, were estimated to be $14.1M. Operating costs included in the PEA were based on mining, processing, administration and reclamation, and are listed in Table 5, where they are normalized to process tonnage and recovered gold ounces. Total LOM cash operating costs are projected to be $778/oz Au and LOM capital cost was estimated to be an additional $246/oz Au. This updated PEA includes additional geologic data produced in the Q1 2013 RC definition drilling at the Jolly Jane resource, which was used to update the Jolly Jane resource model. The 2012 Mayflower and Sierra Blanca resource models described in the December 2012 NBP technical report were also used in the mining evaluations. All scheduled resource and mining geometries were redefined by Lerch Grossman optimization using updated parameters to reflect current gold price environment and improved metallurgical data developed during 2012. Resources - The analysis included both indicated and inferred resources in the mining and economic study. Indicated resources make up 23.5% of the gold ounces in the production plan. Project Schedule- The project schedule assumed a one (1) year period for construction of the mine infrastructure, and the initiation of mining at the Mayflower and Sierra Blanca resources. Mining was assumed to start at Jolly Jane in year 3, and production from the three resources was blended to level the required number of haul trucks and reach a peak leach pad loading rate of 42,400 tonnes per day. Mining Method - A standard surface mine using a drill, blast, load and haul mining plan was used for the study, assuming a 50 degree pit slope. The mine volume was defined by Lerchs-Grossman optimization methods and the resulting surfaces at $1,300/ounce gold price were used to schedule production. A cut-off grade of 0.1 g/t gold was used for selection of mineralized material to be sent to the processing facility. Conceptual locations for the crusher and overburden dumps were used to estimate truck haulage cycles, and the production schedule was constrained by the truck fleet capacity. Processing Method - A conceptual heap leach model was developed for the northern area of North Bulfrog to be operated at a peak placement rate of 42,400 tonnes of mineralized material per day, with all material assumed to be crushed to 80% - 19 mm (-3/4 inch), using a large capacity gyratory primary crusher and 2 parallel secondary crushers. All mineralized material was assumed to be placed on the leach pad by conveyor/stacker. A CIC and ADR processing facility with a nominal 8,000 gallons per minute flow capacity was assumed. Gold Recovery Model - Process recoveries were estimated based on the results of column leach testing of composite samples created from the 2012 PQ metallurgical drilling program. A total of 23 sample composites from the 3 current resource areas were created from 2012 PQ core and used to create duplicate column tests at a nominal crushed size of 80% -19 mm (-3/4 inch). The column leach test data was used with a recovery model that simulated the effects of time and leach pad loading to project the produced gold and silver. The recovery model predicted LOM average gold recovery to be 80% of contained gold content and 8 % of contained silver content. Operating and Capital Cost Estimates - Preliminary capital and operating costs were developed using information available from other Nevada heap leach operations, a commercially available mining and development cost database, plus all available project technical data and metallurgical/process related test work. Detailed design work, used to assess the potential for a smaller scale start up mine, has been used to refine the capital cost estimate. Preliminary configurations of the site infrastructure alternatives (heap leach pad, overburden storage facility, roads, shops, offices etc.) have been evaluated and an arrangement was defined as the basis of capital cost estimates. Capital costs were developed based on a nominal mining rate of 37,800 tonnes of mineralized material per day, and 57,750 tonnes per day of mineralized material plus overburden. Total processed material would be 151.8 M tonnes. Major fixed equipment and all mobile equipment was assumed to be financed over the first 5 years of life. All costs are in constant USD from Q2 2013. No escalation was applied in the financial model. Taxes and Royalties - Taxes and royalty charges were excluded from this preliminary analysis of the project. Net smelter return royalty rates vary from 0-4% across the project and average approximately 0.8%, assuming no exercise by the Company of the royalty buy-out rights. Revenue - Revenue was determined in the base case financial model assuming a constant $1,300 per gold ounce. All sensitivities to gold price assumptions were assessed using a constant price. Giroux Consulting Ltd., of Vancouver BC, has produced an updated mineral resource estimate (effective as at June, 2013), based on resource infill drilling at the Jolly Jane resource during 2013. This resource estimate has been used as the basis for the PEA, and will be included in the Report. The current oxidized mineral resources, based on a cut-off grade of 0.1 g/t gold (“COG”), are listed in Tables 6 and 7, for indicated and inferred classifications, respectively. Figure 2: Corvus land position at North Bullfrog with resource areas shown. Corvus controls 100% of its North Bullfrog Project, which covers approximately 70 km² in southern Nevada just north of the historic Bullfrog gold mine formerly operated by Barrick Gold Corp. The property package, shown in Figure 2, is made up of a number of private mineral leases of patented federal mining claims and 758 federal unpatented mining claims. The project has excellent infrastructure, being adjacent to a major highway and power corridor. The project currently includes numerous prospective gold targets with four (Mayflower, Sierra Blanca, Jolly Jane and Connection) containing an estimated Oxidized Indicated Resource of 36.7 Mt at an average grade of 0.26 g/t gold for 307,860 ounces of gold and an Oxidized Inferred Resource of 220.6 Mt at 0.18 g/t gold for 1,288,970 ounces of gold (both at a 0.1 g/t gold cutoff), with appreciable silver credits. Unoxidized Inferred mineral resources are 221.6 Mt at 0.19 g/t for 1,361,000 ounces of gold (at a 0.1 g/t gold cutoff). None of the unoxidized resources are included in the PEA. Mineralization occurs in two primary forms: (1) broad stratabound bulk-tonnage gold zones such as the Sierra Blanca and Jolly Jane systems; and (2) moderately thick zones of high-grade gold and silver mineralization hosted by structural zones with breccias and quartz-sulphide vein stockworks such as the Mayflower and Yellowjacket targets. The Company is actively pursuing both types of mineralization. Jeffrey A. Pontius (CPG 11044), a qualified person as defined by NI 43-101, has supervised the overall preparation of the scientific and technical information (other than the resource estimate) that forms the basis for this news release and has approved the disclosure herein. Mr. Pontius is not independent of Corvus, as he is the CEO and holds common shares and incentive stock options. Dr. Roger Steininger, PhD, CPG, a consulting geologist, has acted as the Qualified Person, as defined in NI 43-101, for the description of the general site information, the mineral exploration, and the site geology portions of the Report. He has 40+ years’ experience and has been involved in mineral exploration, mine site geology and operations, mineral resource and reserve estimations and feasibility studies on numerous underground and open pit base metal and gold deposits in Canada, the United States, and Mexico. He is a Certified Professional Geologist (CPG 7417), certified by the American Institute of Professional Geologists. Dr. Steininger is independent of the Company under NI 43-101. Mr. Gary Giroux, M.Sc., P. Eng (B.C. ), a consulting geological engineer employed by Giroux Consultants Ltd., has acted as the Qualified Person, as defined in NI 43-101, for the Giroux Consultants Ltd. mineral resource estimate contained in the Report. He has over 30 years of experience in all stages of mineral exploration, development and production. Mr. Giroux specializes in computer applications in ore reserve estimation, and has consulted both nationally and internationally in this field. He has authored many papers on geostatistics and ore reserve estimation and has practiced as a Geological Engineer since 1970 and provided geostatistical services to the industry since 1976. Both Mr. Giroux and Giroux Consultants Ltd. are independent of the Company under NI 43-101. Mr. Scott E. Wilson, CPG, President of Metal Mining Consultants Inc., is a consulting geologist specializing in surface mine design, optimization and analysis, production scheduling, due diligence evaluations and Mineral Resource and Reserve reporting. He is acting as Qualified Person, as defined in NI 43-101, for the evaluation of the mining design, production schedule, operating costs, project capital costs, and financial evaluation portions of the Report. Mr. Wilson has over 23 years experience in surface mining and is a Registered Member of Society of Mining, Metallurgy and Exploration. Mr. Wilson and Metal Mining Consultants, Inc. are independent of the Company under NI 43-101. Mr. Herbert Osborne, a consulting process engineer for Interralogic, Inc., has acted as the Qualified Person, as defined by NI 43-101, for evaluation of the metallurgical testing data portions of the Report, and process evaluation, process operating cost estimation, and process and infrastructure capital cost estimation and financial evaluation portions of the Report. He has over 50 years of experience in mineral process design and operations. He is a registered Member of the Society of Mining, Metallurgy and Exploration (SME Member No. 2430050 RM). Mr. Osborne and Interralogic, Inc. are independent of the Company under NI 43-101. The work program at North Bullfrog was designed and supervised by Russell Myers (CPG 11433), President of Corvus, and Mark Reischman, Corvus Nevada Exploration Manager, who are responsible for all aspects of the work, including the quality control/quality assurance program. On-site personnel at the project log and track all samples prior to sealing and shipping. Quality control is monitored by the insertion of blind certified standard reference materials and blanks into each sample shipment. All resource sample shipments are sealed and shipped to ALS Chemex in Reno, Nevada, for preparation and then on to ALS Chemex in Reno, Nevada, or Vancouver, B.C., for assaying. ALS Chemex’s quality system complies with the requirements for the International Standards ISO 9001:2000 and ISO 17025:1999. Analytical accuracy and precision are monitored by the analysis of reagent blanks, reference material and replicate samples. Finally, representative blind duplicate samples are forwarded to ALS Chemex and an ISO compliant third party laboratory for additional quality control. McClelland Laboratories Inc. prepared composites from duplicated RC sample splits collected during drilling. Bulk samples were sealed on site and delivered to McClelland Laboratories Inc. by ALS Chemex or Corvus personnel. All metallurgical testing incorporated into the Report was conducted or managed by McClelland Laboratories Inc.
Corvus Gold Inc. is a resource exploration company, focused in Nevada and Alaska, which controls a number of exploration projects representing a spectrum of early-stage to advanced gold projects. Corvus is focused on advancing its North Bullfrog project towards a potential development decision and continuing to explore for new major gold discoveries. Corvus is committed to building shareholder value through new discoveries and leveraging noncore assets via partner funded exploration work into carried and or royalty interests that provide shareholders with exposure to gold production. This press release contains forward-looking statements and forward-looking information (collectively, “forward-looking statements”) within the meaning of applicable Canadian and US securities legislation. All statements, other than statements of historical fact, included herein including, without limitation, statements regarding the anticipated content, commencement and cost of exploration programs, anticipated exploration program results and the timing thereof, the discovery and delineation of mineral deposits/resources/reserves, the potential for the identification of multiple deposits at North Bullfrog, the potential for a low capex and/or opex heap leach mine operation at North Bullfrog, the potential for there to be a low strip ratio in connection with any mine at North Bullfrog, the potential for a production decision to be made, the potential commencement of any development of a mine at North Bullfrog following a production decision, the potential for any mining or production at North Bullfrog, the potential for additional resources to be located between certain of the existing deposits, the potential for the Company to secure or receive any royalties in the future, business and financing plans and business trends, are forward-looking statements. Information concerning mineral resource estimates and the preliminary economic analysis thereof also may be deemed to be forward-looking statements in that it reflects a prediction of the mineralization that would be encountered, and the results of mining it, if a mineral deposit were developed and mined. Although the Company believes that such statements are reasonable, it can give no assurance that such expectations will prove to be correct. Forward-looking statements are typically identified by words such as: believe, expect, anticipate, intend, estimate, postulate and similar expressions, or are those, which, by their nature, refer to future events. The Company cautions investors that any forward-looking statements by the Company are not guarantees of future results or performance, and that actual results may differ materially from those in forward looking statements as a result of various factors, including, but not limited to, variations in the nature, quality and quantity of any mineral deposits that may be located, variations in the market price of any mineral products the Company may produce or plan to produce, the Company's inability to obtain any necessary permits, consents or authorizations required for its activities, significant increases in the cost of labour, materials, equipment and supplies required to develop and operate any mine at North Bullfrog, the Company's inability to produce minerals from its properties successfully or profitably, to continue its projected growth, to raise the necessary capital or to be fully able to implement its business strategies, and other risks and uncertainties disclosed in the Company’s latest Annual Information Form and interim Management Discussion and Analysis filed with certain securities commissions in Canada. All of the Company’s Canadian public disclosure filings may be accessed via www.sedar.com and readers are urged to review these materials, including the technical reports filed with respect to the Company’s mineral properties.